^ Cicmil, N. & Shi, L. (2008). 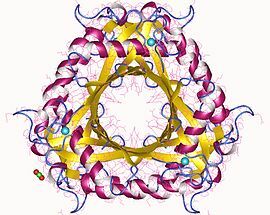 „Crystallization and preliminary X-ray characterization of queD from Bacillus subtilis, an enzyme involved in queuosine biosynthesis”. Acta Crystallogr. Sect. F Struct. Biol. Cryst. Commun. 64: 119—122. PMID 18259064.